How has MindSoothe Jnr. helped others? What are the ingredients in MindSoothe Jr.? Childhood depression is not always as easily diagnosed as adult depression and can be masked. Children who are depressed do not always look sad and 'down' all the time, but may have other persistent symptoms that indicate that there is a problem. If you suspect that your child may be suffering from depression, it is always best to consult a psychologist for diagnosis and to determine the underlying causes of the depression. Children and especially teenagers who talk about suicide should always be taken seriously. While this is sometimes a way to get attention or may be something the child learned about at school, it could be serious and it is always better to be safe and have your child properly assessed. Never discontinue prescription medication without first consulting your doctor or a health care professional who is experienced in natural medicine. All children will have some of these symptoms now and again and this does not necessarily mean that they are depressed. Only when there are three or four of the above symptoms which carry on for a few weeks or more, is there cause for concern. Childhood depression is often mis-diagnosed. Children with other disorders may also develop depression which is secondary to their main problem or diagnosis. This includes children with ADD and ADHD, children with Autism or PDD NOS, those with family problems and even children who have other medical problems or disabilities. MindSoothe is an all-herbal natural treatment for depression and anxiety. It has been used in the treatment of adults and older teenagers for many years and is formulated by a Clinical Psychologist. Because of the increasing demand for a safe, natural herbal treatment for children with depression or those with Autism and related disorders, Feelgood Health has developed MindSoothe Jr. Using the same highly successful formula, Mindsoothe Jr. contains St John's Wort and Passiflora in child-friendly dosage. Like all Feelgood Health products, Natural Kids MindSoothe Jr. has been developed with care by our practising Clinical Psychologist, is 100% natural and manufactured according to the highest pharmaceutical standards. Individual ingredients are well-researched and have been specially chosen for their high safety profile in childrens’ remedies. "I recently purchased MindSoothe and Focus Drops for my son who is ADHA and in the three weeks since he has started to take the drops we are absolutely delighted with the fabulous little boy that has emerged!!! Many thanks for all your help and as i say our little guy is brand new and very happy with life at the moment which is unbelievable as everything about his condition used to get him very down... thank you again." "My son has ADHD. - he always struggled to complete his work and I think that he became depressed because he was always in trouble. We started him on your Focus remedy which helped but he was still very angry and irritable with everyone. Mindsoothe Jr took away the irritability from Day One and he is now doing very well at school and at home." "I have a child with autism and the doctors recommended that I put him on prescription anti-depresaants. One recommended wellbutrin and the other said that paxil would work, but I am not in favor because my child is only 6 years old. We have used the mindsoothe jr for a few weeks and I just wanted to inform you that he is much less restless and seems calmer than before, making it easier for me and my wife. I also notice that he does not flap his hands around so much and he used to pick at his skin which is much less now too - only when he is very tired." The ingredients in MindSoothe Jr. are well researched and have been shown to be effective in the treatment of depression and anxiety. Both are very well respected naturopathic herbs and have been safely used for centuries. Depression is often associated with an imbalance in certain neurotransmitters in the brain, especially serotonin. This is often caused by stress, but may also be hereditary or linked to disorders like Autism or other developmental disorders. St John's Wort, one of the principle ingredients in MindSoothe Jr. is widely used as a treatment for depression and other disorders associated with serotonin imbalance. It has been well researched and many clinical studies have demonstrated that it can be highly effective in the treatment of depression and other mood disorders. Passiflora has been extensively used by naturopaths as a calmative and to reduce irritability, restlessness and anxiety. It acts as a natural tranquilizer, without further aggravating the symptoms of depression, which can happen with the use of some herbs like Valerian. The proportion of St John's Wort and Passiflora in the remedy has been carefully calculated to ensure therapeutic dosage and maximum effectiveness. 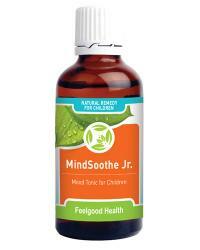 Note: Natural Kids MindSoothe Jr. contains less than 1% pure pharmaceutical grade ethanol when diluted as directed. Instead of the capsules used in the adult formula, Mindsoothe Jr. comes in convenient and easy to administer drop form. Determining dosage is easy as Mindsoothe Jr. is especially formulated to be administered at the dosage of one drop per age year of the child. Simply dilute Mindsoothe Jr. in a little water or juice (about 1/4 glass). No more fussing and pleading with your child to swallow pills or capsules! Use the recommended dosage in your child's favourite juice - nothing could be easier! Mindsoothe Jr. contains two different ingredients, which act in different ways. The Passiflora takes effect very quickly, especially when presented in tincture form. You should notice that your child is calmer, less irritable and less easily frustrated. St John's Wort works by preventing the over-metabolism of serotonin and the effect is gradual, taking 3 - 5 weeks to reach its full potential. Within this period you should notice a gradual improvement in mood and behaviour, as well as concentration. It is important that Mindsoothe Jr. be used regularly as recommended. Continue use for about 6 months and then gradually taper off over a period of about 3 weeks. If symptoms do not return it will not be necessary to continue treatment. However, should your child's symptoms return when discontinuing MindSoothe Jr, then it is safe to continue with the remedy as long as it is needed.